Make sure you're getting the best bone broth! Bone broth is promoted as a natural source of collagen, an immune-booster, and a remedy for everything from joint pain to wrinkles. But how much collagen and protein is really in each brand? Are they high in sodium? Are bone broth labels correct? Can they do all the things people say they can? 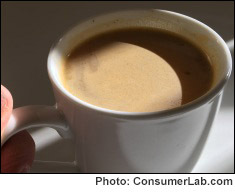 To answer these important questions, ConsumerLab.com purchased and tested popular bone broth liquids and powders. In addition to finding out how much protein, collagen and sodium was really in each product, each bone broth was also checked for potential contamination with lead, cadmium or arsenic — toxic heavy metals. We were shocked to find that one product delivered only 38% of the protein listed on its label. Making matters worse, it had 75% more sodium than listed — a concern for anyone with high blood pressure. We also found big differences in cost: You could pay from 56 cents to $9.99 to get an equal amount of collagen, depending on the product. Among the bone broths that passed our laboratory tests, provided good amounts of collagen and total protein, were judged favorably in our taste tests, and were well priced, four products were selected as Top Picks.